It’s been a busy summer for the DataVault, with further presentations taking place. First up was a short trip to Dublin to the Open Repositories 2016 conference in June. The presentation was scheduled to be part of the 24×7 session: 24 slides to be presented in 7 minutes – that’s a mere 17.5 seconds per slide (rather than the usual rule-of-thumb of a minute or two!) and with the slides auto-advancing for a bit of added fun!. Thomas Higgins and Stuart Lewis presented, and gave an overview of the project, the platform, and gave a demonstration. A copy of the slides is available for download. 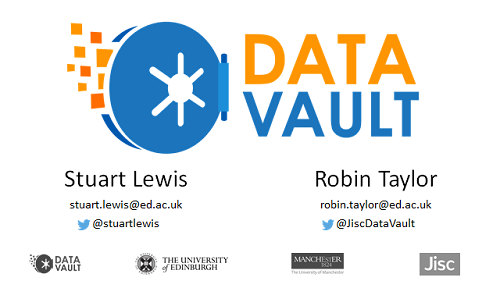 Then in August, Mary McDerby and Stuart Lewis attended the Repository Fringe in Edinburgh, where Stuart presented the DataVault in a session led by the DCC’s Angus Whyte, alongside Rory Macneil from ResearchSpace, looking at the subject of research data workflows, and what this means for systems such as the DataVault which sit within those workflows. The DataVault has been out and about recently: first to the International Digital Curation Conference (IDCC) in Amsterdam in February, and more recently to the first meeting of the new Jisc Research Data Network. Did we present valid use cases for a Data Vault system? Do you see the need for a Data Vault iatyour institution? Do you think the Data Vault does enough ‘preservation’? Do you think the Data Vault is missing any obvious features? Perhaps the most interesting piece of feedback was that at IDCC, which is an international conference, the feedback to question 2 (“Do you see the need for a Data Vault at your institution”), the response was 50% yes, and 50% no. However at the Jisc event which only contained a UK audience, the response was 100% yes. The slides are available for download. 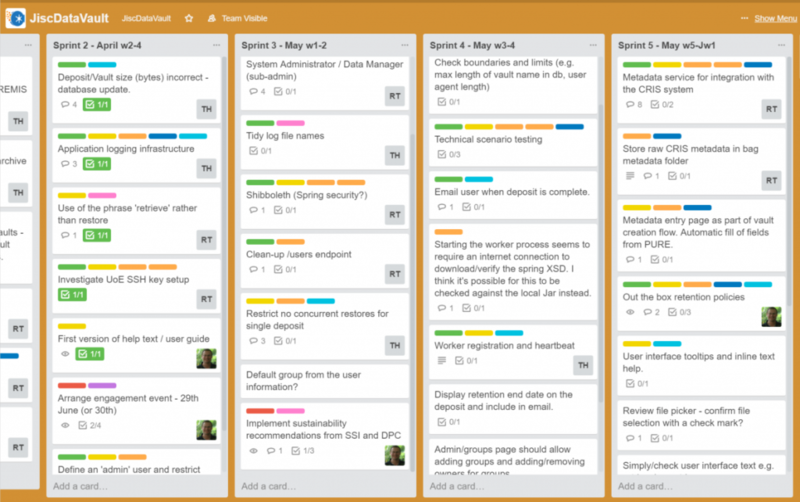 We’re now in the third phase of the DataVault project, and as previously discussed, we are using fortnightly development sprints to undertake the remaining development tasks. Following our monthly project meeting yesterday, we now have draft sprints to take us up until the end of June, and the first full release of the software! Keep an eye out for a future blog post: we’re scheduled to hold an event for potential early adopters of the DataVault system in their own institutions. 29th June, central London! Between now and then we have planned a further four sprints (sprints 3, 4, 5, and 6). 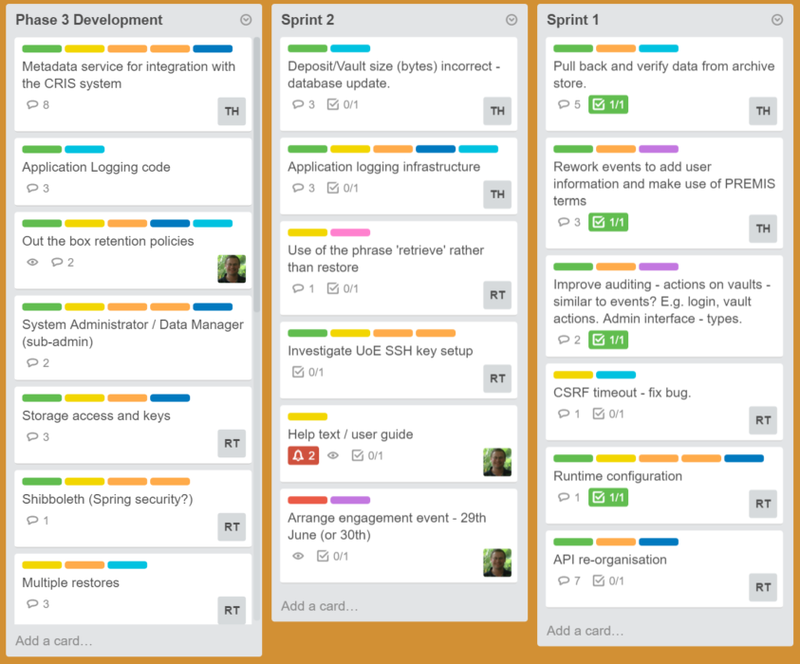 We plan these in details at the start of each sprint, but right now we have indicative backlogs for the next three. Not only will these involve further developments to the software, but also test installations at our institutions to allow more thorough testing of the software in-situ, especially once fully configured into local systems such as Shibboleth and PURE. All of the Jisc #DataSpring projects have also been reviewed by both the SSI and the DPC in terms of sustainability and good practice from an open source perspective. We’re glad to report a relatively good result, but there are a few areas where we can improve – so we will also be addressing those in the coming weeks. These include better documentation, links about how to contribute to the project, and clearer contact details. Over the next few months we will be hosting a series of workshops, with the aim of engaging with the community to refine the Data Vault platform solution developed so far. Now that the Data Vault project has received second round finding, we thought it was time for a makeover! Data Vault receives round 2 funding! We’re pleased to announce that following the second round of project pitching in London on the 13th and 14th of July, the Data Vault project has been awarded further funding. We are grateful to Jisc for providing this second round of funding which will provide effort from August to November.